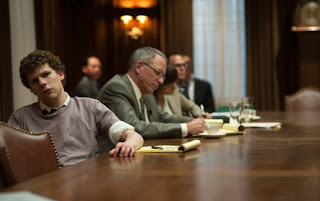 The Social Network won the Golden Globe award for best drama film, and it looks set to win the Oscar for best film. The only reason I can think of for the film's unworthy glory is that it was released at a time when Facebook is very relevant and is something people want to investigate more. Sadly though, this film says absolutely nothing interesting about Facebook itself. With all the accolades and hype directed towards The Social Network, I sat down to watch the biopic on Facebook creator Mark Zuckerberg with expectations of quality. I found the film so unenjoyable that I wondered if I'd downloaded some pirated version which included all the bad cuts like the film in Broken Embraces. In a single word, I found The Social Network a chore: tedious and slow-paced with one-dimensional characters and uninspiring cinematography. Zuckerbeg is portrayed as a friend and money-hungry villain while Napster creator Sean Parker (played by Justin Timberlake) is an equally cliched character, filling the bad boy mould. What a disappointment from David Fincher, the mastermind director of Fight Club some moons ago. Fincher's story-telling has no finesse. Rather than investigate the motivations of Zuckerberg's actions, the film constantly flashes forward to a dreary legal battle over who founded Facebook. In fact, the film mostly steers clear of discussing the nature of Facebook and its effect upon society which would have given the film a greater sense of purpose. (For an interesting discussion of Facebook, check out Time magazine's feature on Zuckerberg as their Person of the Year 2011). The Social Network stinks, and in my view isn't much that sets it apart from your average Hollywood, rich-kid, college flick. If I could have the two hours back, I would rather spend them on Facebook.